Our latest arctic blast has got me going through old pictures, and I found a few that have been sitting around for a while. 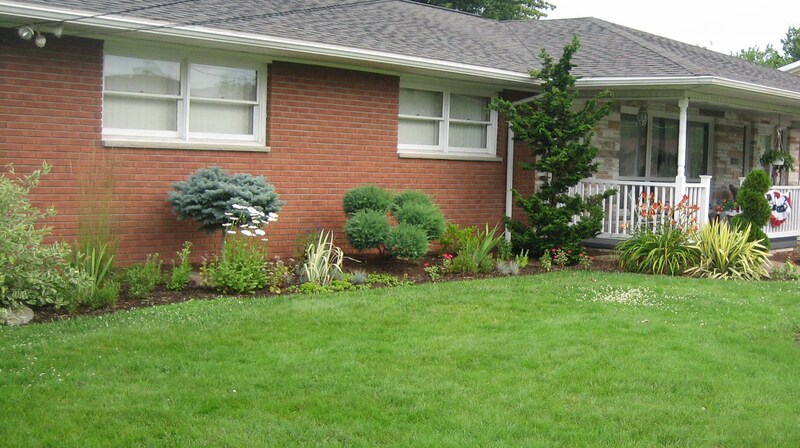 They’re all about the bed along the front of the house, and they all relate to a redesign I attempted this past spring. Let me know what you think! Now what to do? 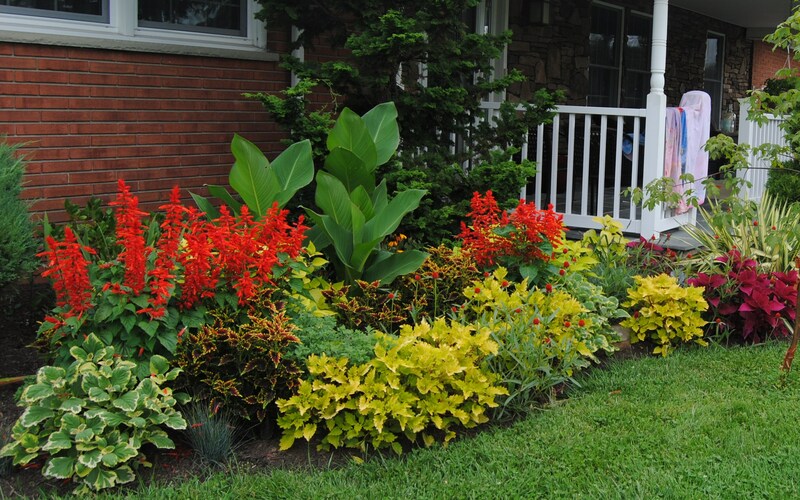 The next year I had no enthusiasm for the bed without my lovely coleus and salvia. 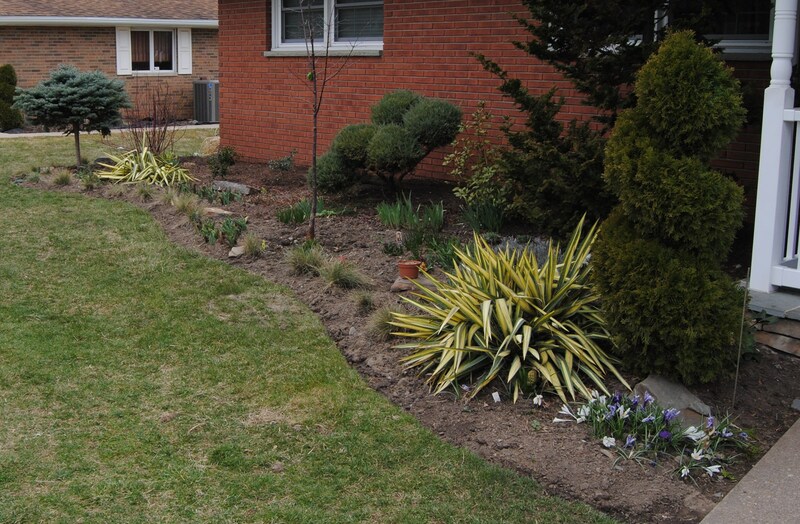 A few perennials filled in to give it a fuller look, but it still lacks something. The blue spruce was getting too big for under the window, and the Chamaecyparis too tall….. and I was getting tired of trimming the silly pompom juniper. So late that fall I laid out a bed expansion. 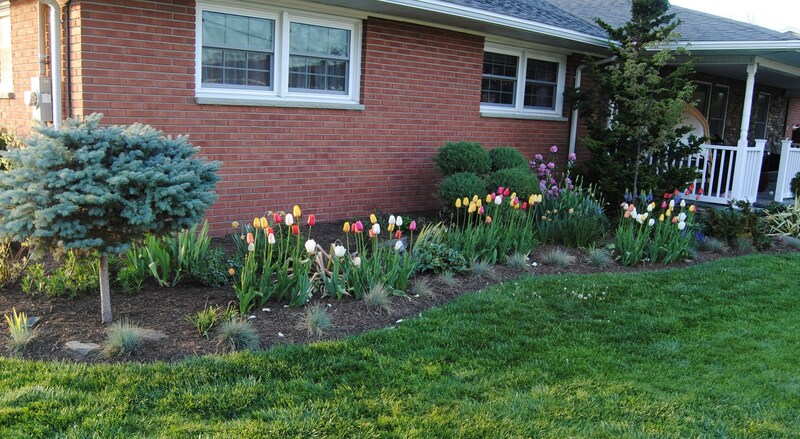 Truth be told I over estimated the space available for tulips, so after lining out the new border I dug tulips in all around in the lawn and then left the grass for spring removal. 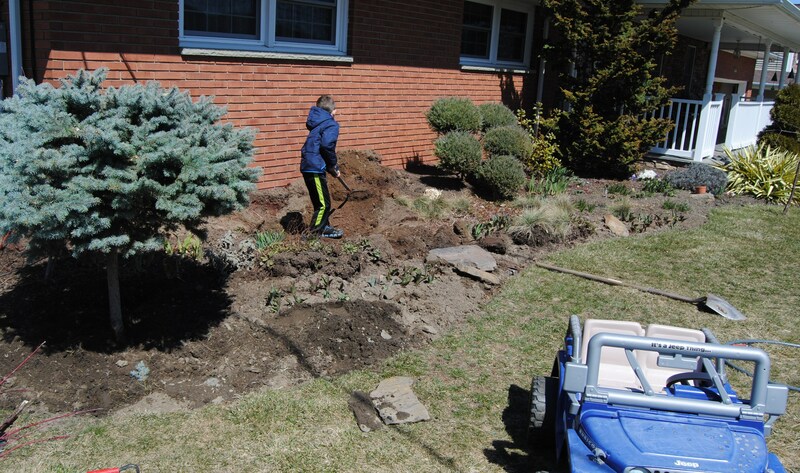 That spring as the tulips came up through the overturned sod, I finished digging under the rest of the grass. Moving the spruce was no picnic, and I almost thought it would die (considering how many roots I cut) but I think it will be much better off in the new position, and give a nice anchor to the end of the bed. 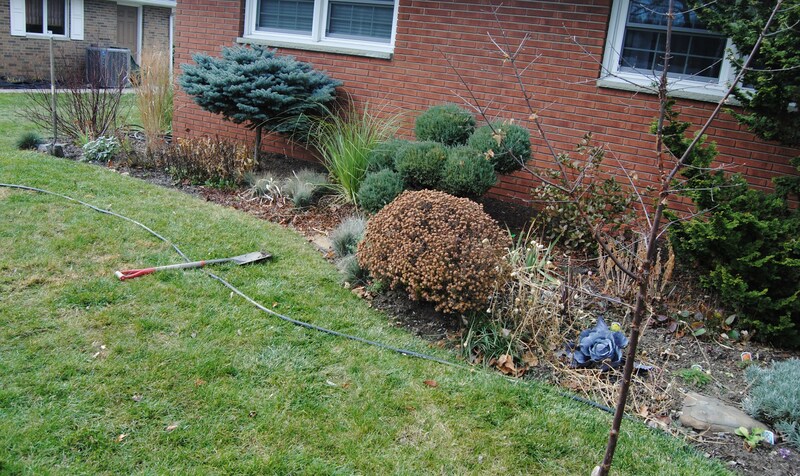 Fortunately for me, just when the shrub moving started to get too back-breaking, a buddy stopped by to help. I do like the yucca “color guard”. 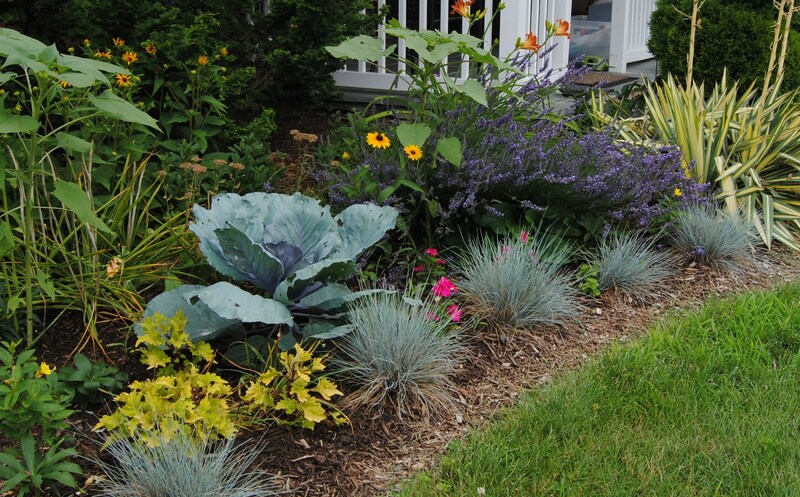 It and the blue fescue seem to be a nice fit for this border. Blues, yellows , and greens seem to complement the house better than all the loud mixed up flower colors. For a couple weeks I didn’t mind this look, even as the tulip foliage yellowed and died off. But then boredom and excess plants struck, and I was back to my old ways of sneaking in a few new plants here and there. Red cabbage wasn’t the worst color to add, but maybe it was just a little inappropriate for a front yard foundation planting. Coleus crept in again, and the sunflower seedlings looked so innocent in the early summer…. but the lavender with the yucca and blue fescue kept it respectable. Sunflower explosion. Still better than my red experiment, but not yet the look I was going for. Maybe annuals are just not a good choice for this bed. I’ll rethink it next year and maybe skip the dahlias too 🙂 For now I’ll use the excuse that they distract you from the too-small hollies planted under the window…. better to be distracted than to be downright bored I think…. By the way those hollies better get growing, I want them nice and big and prickly by the time my little daughter starts to consider things like sneaking out a window or meeting some Romeo who comes by throwing pebbles. The border last month (before winter and winter boredom hit). 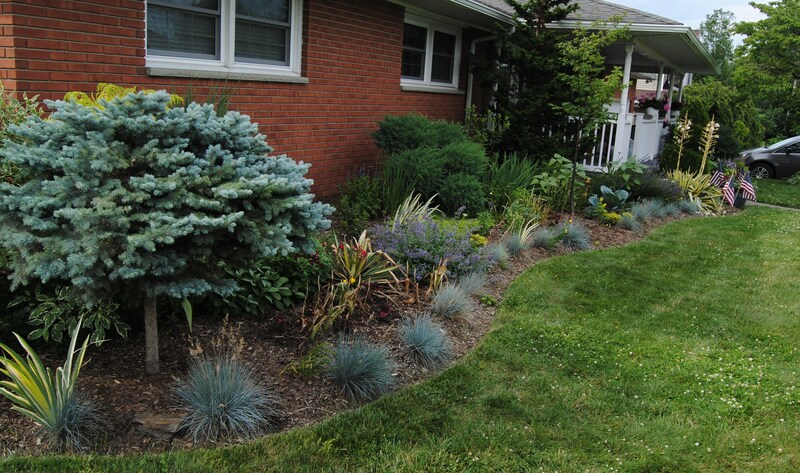 Four things: bigger plants, get rid of the grasses, remove the tall evergreen, and stick to a mellow color palette…. and of course expand the bed just a few more feet 🙂 Any other suggestions? I know there will be some good ones and I’m looking forward to hearing them as well as hearing some more criticism. I can take it, and I’m hoping it will get me back on the path that leads to me finally liking this bed! 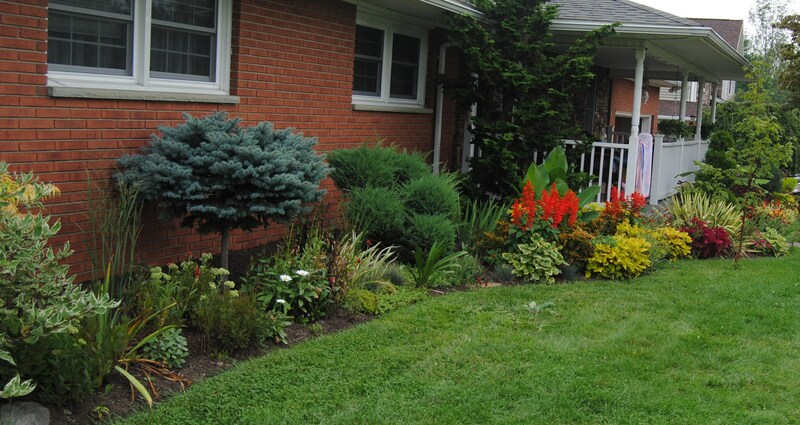 This entry was posted in annuals, early spring chores, garden design, garden stories, red border, shrubs, Uncategorized and tagged flower border renovation, foundation plantings, garden design, garden renovation, gardening, new flower bed, transplanting a blue spruce, transplanting shrubs, yucca color guard. You’ve certainly worked hard – what a transformation. It looks great, I like the curve and the structural planting giving interest all year. The verandah is great – I’d like one! That’s the only similarity to a ranch ;). How cheeky to plant a cabbage in between the flowers, Frank. Try Cavolo nero next time – the Italian gigolo among the cabbage folk. haha, a large kale plant might be perfect! I visited a public garden this summer where cavalo nero was planted in ribbons alternating with redbor and other ‘cabbage folk’, it was quite the effect but maybe a little too much even for me. Thanks for the kind words. Hopefully the bed will still improve, I’m not thrilled with it yet…. I think it was a good idea widening the bed, narrow beds always look skimpy. I like the evergreen foliage as a nice backdrop to whatever you plant. I don’t know about the cabbage though. Did you put it there because you like to startle? Why don’t you choose which colour scheme you want to use and stick to perennials and your lovely tulips for the spring? I am hopeful the evergreen backdrop grows in over the next few years, but then I’m also tempted to replace a few of them with something more interesting! -I should really try and show some patience though. What color scheme would you chose? I think so far the gray-blue-purple-soft yellow seems to work best for me, but I’m entirely open to suggestions. Hmmmm. I did plant a few peony seeds a couple months ago…. maybe in another 7 or 10 years I might be able to add one! I like the idea of a few species hellebores. I already have a few hybrid seedlings in there and was thinking of adding a few more, it’s a sunny and fairly hot spot, but they don’t seem to mind. I wonder if being close to the house might help some of the less hardy types? Not really helping wit the less is more theme, but the nice summer greens should help balance out any other wild colors that happen to show up. I like the curving line of the bed and admire your willingness to experiment. It seems a good strategy. I really like the curve (I don’t like straight lines at all) and think the whole bed looks great – except for the cabbage…. 😉 The sunflowers are gorgeous, as is the yucca. I definitely agree on widening the bed. I grew some Cosmos from seed a few years ago and they brightened up a large area without actually taking up much ground space, so that might be an idea. You don’t have to tell me twice to widen the bed some more! I tried splitting up the yucca but the division sulked all summer and only recovered come autumn, but I think it will look more impressive next year…. especially without cabbage as a neighbor! Cosmos might be worth a try, I have to see if I have a pack of seeds left somewhere. You did a really nice job and my only suggestion is making the bed wider. You have a ranch home, so not too wide though. The eaves or cornice line (height of first floor wall) dropped down to the ground is the widest to go to keep the house in balance. Just a rule of thumb, but in this case looks like it would work. That’s a good rule of thumb, and it might be my first project for the spring. Currently the bed may be close to that width at the one end, but still too narrow towards the other. Color is personal, but go with complimentary for accent to the brick for best curb appeal.It is a more harmonious statement. The yellows work well as do your blues. I would forgo that magenta. Too attention grabbing. It’s odd that spring colors don’t bother me as much, it’s only later in the year that the bolder colors don’t fit in as well. I like the blue-purple-gray palette, with the soft yellows for contrast. Blue is opposite orange on the color wheel, so I think much of what you’ve got works well to balance out the orange brick. And it’s just a theory, but if you find the brick color irritating, perhaps try painting the trim to something softer than bright white? I read in one of Sydney Eddison’s books that white stands out and attracts the eye more strongly than any other color. That might keep the eye resting on the softer colors of the bed. The Chamaecyparis (I think?) is too big for where it’s placed, so you are right; it has to get moved. What if one of the taller grasses moved to its place–would it get enough sun to be full? I like the what-I-think-is-Panicum growing behind the blue spruce, and those grow rapidly enough that they’ll fill out and you can divide them until you get sick of them, then you can do something else. Personally, I think I’d like the effect of lots of grasses in contrast to your evergreen shrubs. (Piet Oudolf would approve.) I like the second cluster of the ‘Colorguard’ yuccas midway down the bed that seems to be peeking out from behind the chrysanths. Those two combined with the blue fescues clumped around it would look excellent, I think. And what the hell, add a few more of those cabbage. What a fabulous shade of blue. I love how the color pops against that Chamaecyparis (too bad it has to move). A cluster of the cabbage close together would make that steel blue show up across the street. What fun is gardening if you don’t take risks? I think that the sense of resistance comes from knowing it’s cabbage. 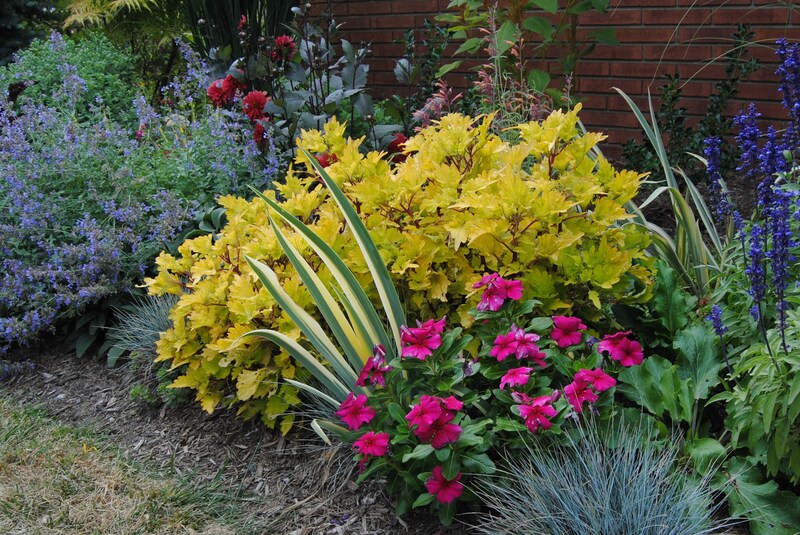 Otherwise, it’s got magnificent color, and great leaf contrast with your other plants. Maybe for height and color, you could try something along the lines of Nepeta ‘Six Hills Giant’? Would it die back to the ground every year for you? Or maybe a Vitex, if it wouldn’t get too big? Have fun! Can’t wait to see what you choose. Thanks for the ideas! You are picking up on a lot of the points that I don’t like about the bed (and the house!). I would like to be able to change the trim colors but don’t think it’s going to happen. We should have gone with a more natural tone on the windows and then worked off that…. But it’s white now, so until that lottery money rolls in…. I’m a little chicken about removing the evergreen, it’s such a big part of the house front it’s going to take some working up of nerves to do it. Between you and me I’m considering planting a hardy banana in its place. It won’t be much in the spring but should grow quickly, I just wonder how long I can tolerate its winter disappearance…. I think the corner is too shady for a big grass. I might divide all the fescue again this spring and try for another division off the yucca, also there’s a nepeta in there already and I might try dividing that too -it’s so hardy and the bees love it. I have to go through your suggestions again later, I think I’m getting a lot of good ideas for next year! I still need a good yellow….. I wonder if rudbeckia would be too golden. Soft blues against the orange brick are the obvious choice and I agree with Amy that maybe you could change the white for a soft grey. I too would add more grasses such as Calamagrostis or Miscanthus. I always think it is good to plant a front garden for predominantly winter interest as it is what you see every time you come home or go out. Also nice for the neighbours. Nepeta or a lower growing Perovskia might workbut as you say keep the palete of plants and colours simple. I will have to reconsider taking out the grasses, and as I think about your suggestion I may have to add either a hearty miscanthus or possibly a plant or two of ‘dallas blues’ panicum. The fall and winter color of this panicum has an orange tint to it and that might look really good! (except for the few empty weeks between cutting back and regrowth. Why move the grass? 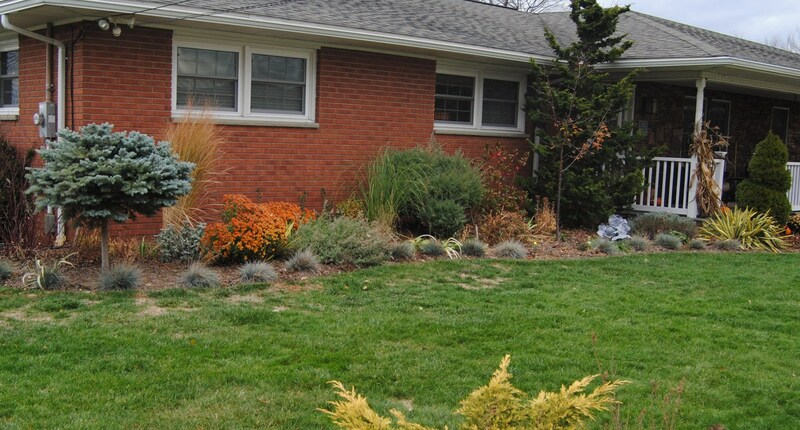 I think the fescue looks good, and I’d put in more grasses and perennials with blue green foliage and/or flowers: ‘Dallas Blues’ Switchgrass, Amsonia, Baptisia australis, Aromatic Aster (Symphyotrichum oblongifolius). The fescue will stay, but the taller grasses just don’t spend enough time in their full grown, impressive stage. I do like your suggestions for amsonia, the colors from spring to winter will be perfect (I think! ), and maybe I can convince myself to give baptisia another try…. it takes up so much room, but would do a good job covering bulb foliage. What’s the name of the mini tree on the far left corner of the house? 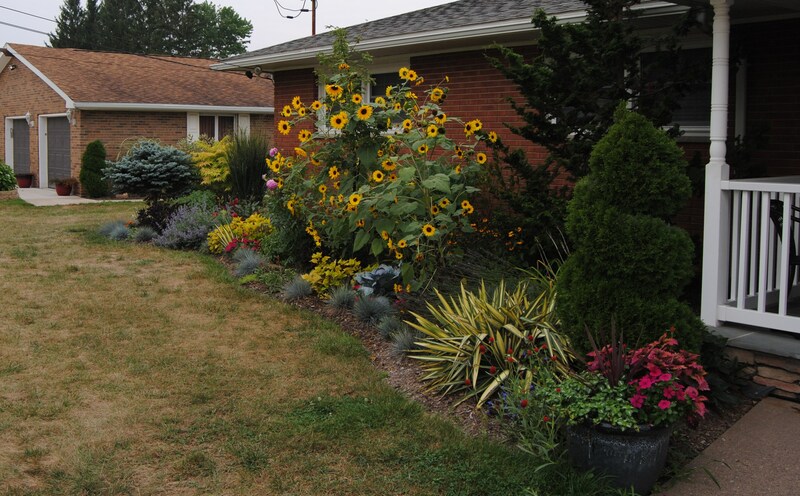 I think it looks great those sunflowers got huge! Thanks! I think you mean the blue spruce? It’s a dwarf one and used to be one of those lollipop trees, but it’s grown a lot since.